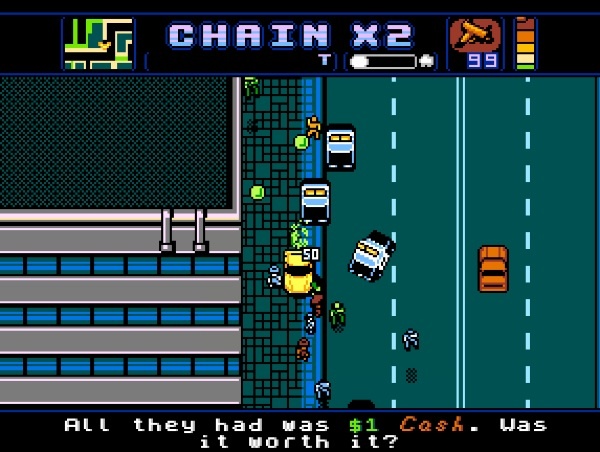 Exploration – Even considering its 2D space, exploration in Retro City Rampage can be fun and rewarding. There’s no shortage of things to do and find: score-based challenges, collectables, hidden areas, character customization, mini-games, and much more. You can just drive around the city, blow up cars with rocket launchers, or attack cops with a golf club in a superhero outfit. The game’s map is a little on the small side, but every pixel is used to its fullest, filling the city with so much to do and see. The variety, exploration, and opportunities for fun is everything you’d want in a modern 3D open world game, yet it was replicated perfectly in a 2D space. References! 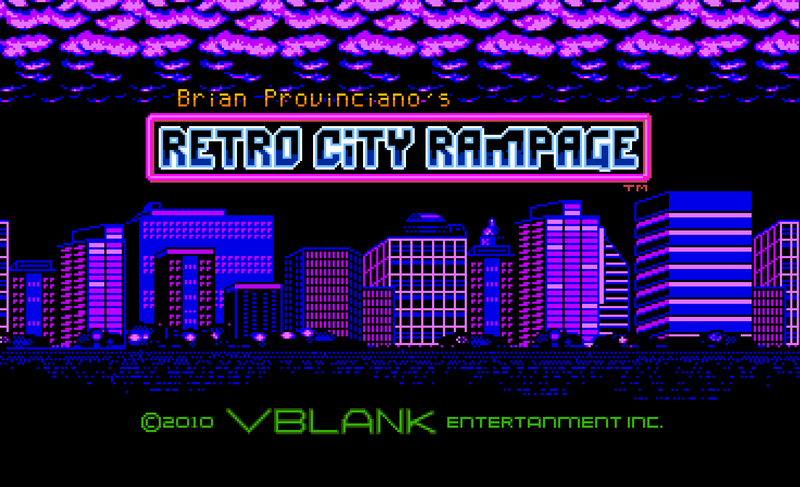 – From the first moments it’s clear that Retro City Rampage is a parody. Every second of the game contains a parody of something. Movies, games, music, memes; if you name it, the game spoofs it. The sheer variety of the jokes is what makes the game enjoyable, as you never know what to expect next. Whether it be a cleverly-named store or a familiar character, the game’s humor will keep a smile on your face. The best references of all are the cameos by characters like Super Meat Boy and Commander Video. Most cameo characters have their own playable mini-game, which you could easily sink hours into. These characters can also be unlocked for free roam, providing unique changes to the gameplay and the game world. Ever wonder what ‘Splosion Man would do to a crowded city? Now you can find out. Mission variety – Missions go hand-in-hand with the game’s humor. Where constant running and driving could become stale, RCR is always coming up with new ways to keep things interesting. Instead of riding a car, why not ride a giant ape? How about a tailing mission that requires you to drink coffee to stay awake? What about driving a car that gains speed by hitting pedestrians? Missions never get boring, especially if you’re sticking to the main storyline. Not every mission is a winner, there are some run-of-the-mill shooting and driving sections, but they’ll be easily forgotten next time you’re told to throw dynamite into traffic. Retro-ness – There are a lot of charming additions in this game that harken back to retro gaming. There are options to change the color scheme of the graphics, the chiptunes that play in the background, and you can even have the screen’s border look like an arcade cabinet or classic handheld. Like all older games, the game takes up very little memory space, an added bonus for those who want to maximize their hard drive content. How retro is too much? – In the efforts to embody retro games, a few not-so-great choices were made. Dead bodies look too much like living ones. While there is a difference, it’s easy to miss in the middle of a battle. Some of the sounds are just plain annoying, especially high-pitched blip of bullets hitting metal. The mini-map isn’t very helpful, but thankfully it’s also small and stays out of the way of the main screen. In the end these are just small annoyances, some of which can be fixed just by going into the options. Controls – The game tends to control like a classic 80’s game, which while initially fun it isn’t the best in practice. Jumping precise enough to jump on somebody’s head can be frustrating, especially when your mission depends on it. The cover system feels rather pointless, as you can hide behind objects to avoid damage without it. The overall feel of the controls is simply on the okay side of the scale as they are a bit imprecise and sluggish at times. Difficulty spikes – The game does have some unfairly difficult parts, especially during the missions near the end of the game. Oddly enough, failing any mission the first time will bring you to a hint screen, and failing a mission enough will cause the game to make it easier for you. It feels like the game doesn’t know whether to be as tough as a classic game or lean more on the easier hand-holding modern side. 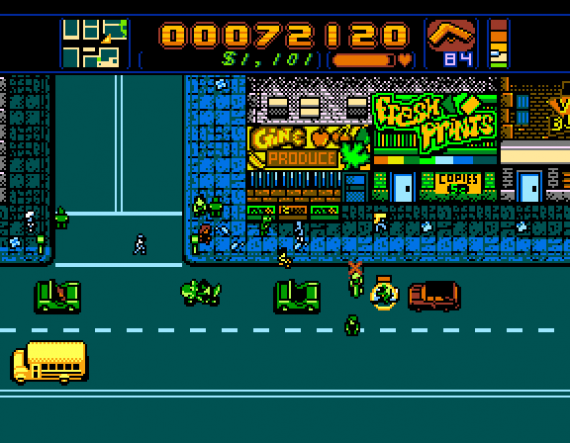 Retro City Rampage is a de-make you didn’t know you wanted, a wonderful mix of the nostalgic and the modern. It’s a great open-world game that always gives you something to do, and will provide many hours of gameplay if you do everything the game has to offer. It does has some design flaws, most of which can be easily overlooked. If you ever get too frustrated, there’s always a joke waiting around the corner to lighten the mood. Whether you gravitate toward the old or the new, this 8-bit wonder is definitely worth your time.